Yet six months after a two-day incident in March at its huge Steckman Ridge facility in Bedford County, Pennsylvania, Spectra Energy still refuses to publicly say how much methane (toxic volatile organic compounds) was vented in an uncontrolled release and why it happened. Enough natural gas to power five homes in the Northeast for a year, according to the Energy Information Administration of the U.S. Department of Energy. Hardly a “small volume” as Spectra Energy officials claim. Moreover, documents from the Pennsylvania Department of Environmental Protection (DEP), reveal that the uncontrolled release was tied to a malfunctioning electronic level switch in a dehydration unit. 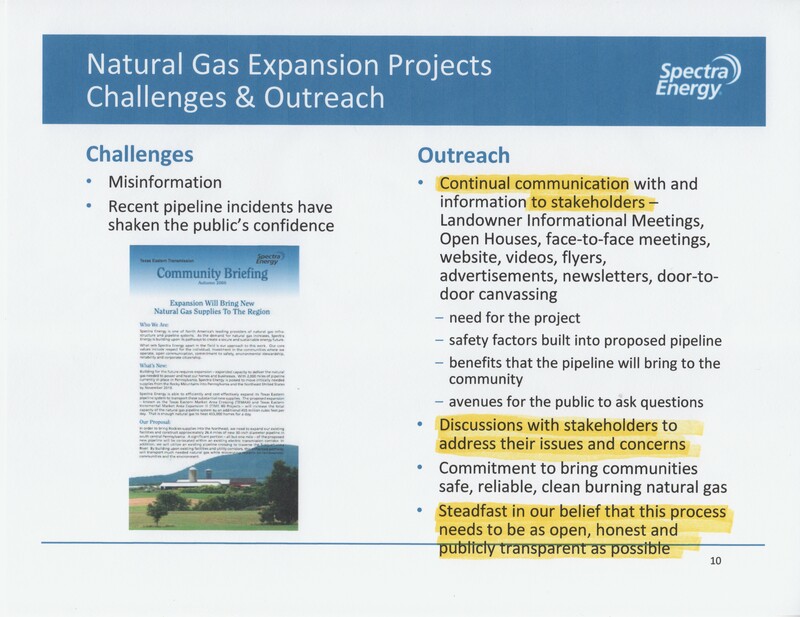 In contrast to the company’s alleged “steadfast … belief” in open communication, Spectra Energy initially dismissed concerns of residents in Clearville (Bedford County), PA, who called 911 in March after hearing firecracker-like noises and seeing what appeared to be smoke coming from the company’s compressor station. First – Only “Air” Was Released! In fact, Hanley said that the only thing that was released was “air,” according to the Bedford Gazette. By the next day, the company was forced to retreat: It admitted there was an uncontrolled release of methane and other hydrocarbons; but claimed only a “small volume” escaped. Broken promises and repeated uncontrolled release of toxic volatile organic compounds (VOCs) raise questions about whether Canadian-born CEO Greg Ebel knows how often Spectra Energy managers fail to do what the company says it does. The U.S. Securities and Exchange Commission (SEC) repeatedly reminds directors at publicly held companies like Spectra Energy (NYSE: SE) that they have an obligation to oversee their company’s risk management and risk strategy and to identify both risks and opportunities for improvement. “With respect to your concerns regarding the Steckman Ridge storage facility” — here he cites the oversight of federal and state regulators such as the Federal Energy Regulatory Commission, PA DEP, PHMSA, and the EPA. Spectra Energy isn’t running a tree farm in Clearville, PA. The company’s stakeholders ask questions about substantive issues and get noise reduction, lighting and trees. Nothing has changed since 2010. The Board’s cosmetic response to ongoing operational problems (shutdowns, blowdowns, uncontrolled methane leaks and valve problems) is as empty as management platitudes about “steadfast belief” in transparency, accountability and stakeholder engagement. There is an increasing level of safety and environmental risk taking by management. A reasonable person would ask how long can Board members get away with tolerating it? Spectra Energy’s huge Steckman Ridge facility is the elephant in the room in Clearville, PA. It is a 12-billion cubic feet underground natural gas storage reservoir on 43 acres, with a nearly 5,000 horsepower compressor station, 13 injection/withdrawal wells and related pipeline infrastructure. It stores and pumps shale gas through transmission pipelines across Pennsylvania and the Northeast. Spectra Energy and its pipeline division, Texas Eastern, are pushing to expand its presence in Pennsylvania, Ohio, New Jersey and other states. Meanwhile, a ring of health, water and operational complaints surround the Steckman Ridge facility that began operations in 2009. Compressor technology is not new, so why do engineers like Ken Shutter and Dwayne Teschendorf who work for Spectra Energy CEO Greg Ebel have so many problems at this facility? Does Ebel know or is he indifferent? Is the Board of Directors likewise indifferent? For example, based on unofficial record keeping by neighbors (aka, Spectra Energy stakeholders), there have been nearly 60 shutdowns, blowdowns and related incidents at the Steckman Ridge compressor station between August 2009 (which included the first, big emergency shutdown) and more recent incidents in March and September 2013. Per the compressor itself, according to a 2009 response from Spectra Energy (the company no longer responds to stakeholder questions), the compressor station houses one 4,735 horsepower reciprocating compressor. This unit includes a 16-cylinder, natural-gas powered engine that drives a 6-cylinder gas compressor used to support injection and withdrawal of natural gas into the underground storage field (located in the Oriskany formation) by boosting pressure when and where necessary. Planting trees is not the answer. But CEO Ebel and his Board of Directors know that, don’t they? 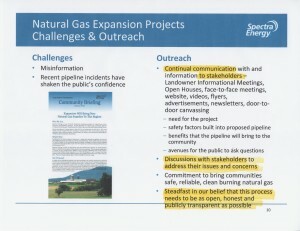 NOTE: This article is cross-posted on the Accountability Central website at this link: http://www.accountability-central.com/nc/single-view-default/article/spectra-energy-betrays-community-latest-4315-thousand-cubic-feet-of-nat-gas-in-uncontrolled-rele/ Accountability Central is part of the Governance & Accountability Institute, Inc.
Spectra Energy has a lot to answer for… tree farmers, wonder why the trees they plant keep having to be replaced?? No wonder!